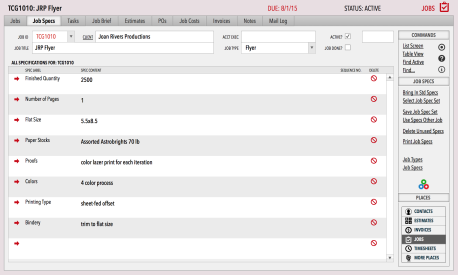 The Job Tracking module is your mission critical control center. Each job is a single record. So, from the entry screen you can click on any tab to see how you are doing on that project, whether you want to determine if a task has been completed, check an estimate, review job costs, find out when the last invoice was sent, enter a note about the job or prepare a report . FileMaker’s signature strength is in finding data fast. The Jobs module takes advantage of that speedy engine so you don’t have to wait. One button takes you to active jobs. You don’t even need to run a report. Atop this lofty perch, you can get to any information in your entire database with a couple of clicks. View the basics on the first tab, then drill down into job deadlines, estimates, specs, actual time and expenses or invoices. It’s all here at your fingertips – literally if you are on an iPad. Find out what its like to have your business information needs met in full, instantly. Keep it all together with Studio Manager. 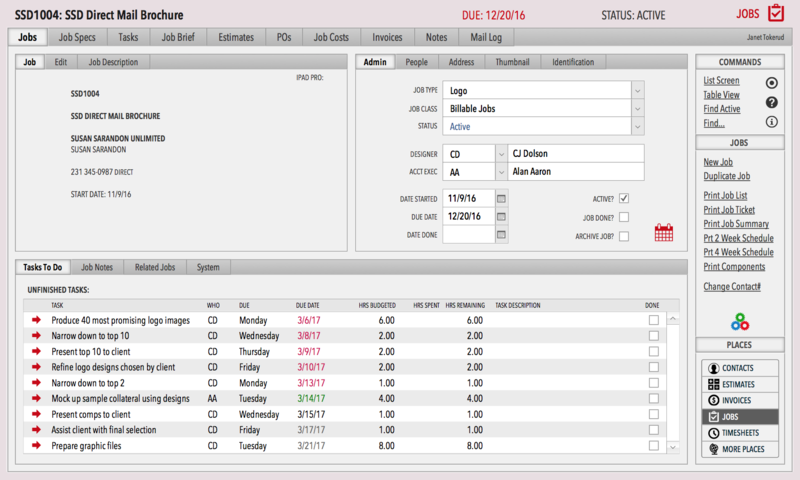 Tracking jobs involves managing people, materials and time. You need to meet deadlines for each task, while operating at capacity, keeping your entire staff busy, but not too busy. It’s a juggling act and Studio Manager is here to help. It offers you a unique project management tool that’s both more intuitive and easier to use than dedicated project management software. See below for a peek at where you set up the deadlines for a job. We have a whole page on scheduling to give you lots more detail. Keep track of the technical specifications for each project on the Job Specs tab. The definition of those specifications is up to you. Start by editing the sample set. You can make it shorter or longer. 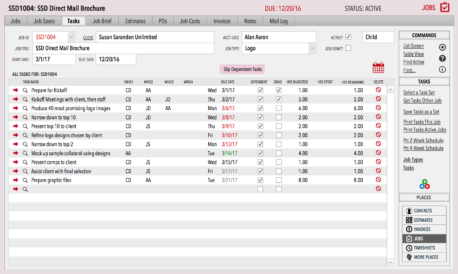 Spec Sets can be assigned to specific Job Types and applied automatically. 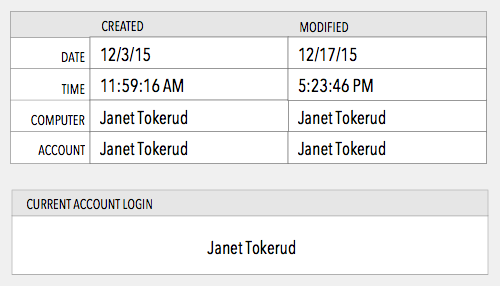 When you duplicate a job, one click optionally duplicates job specs and other key information. By having specs defined clearly and available for all to see and use, projects stay correct and consistent from inception to delivery. 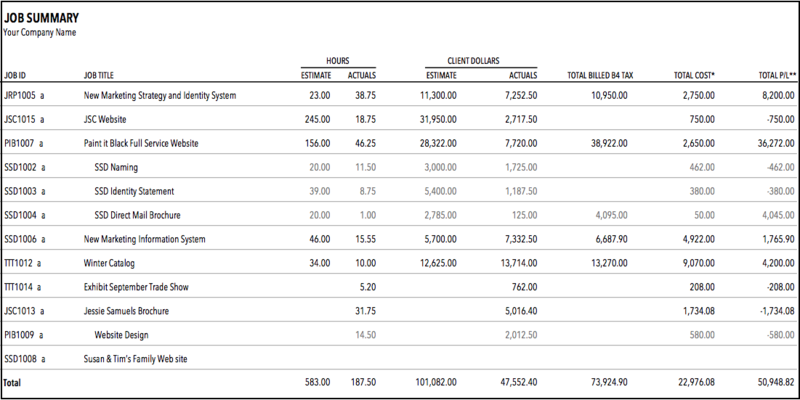 The Job Summary report in Studio Manager doubles as a profitability overview. 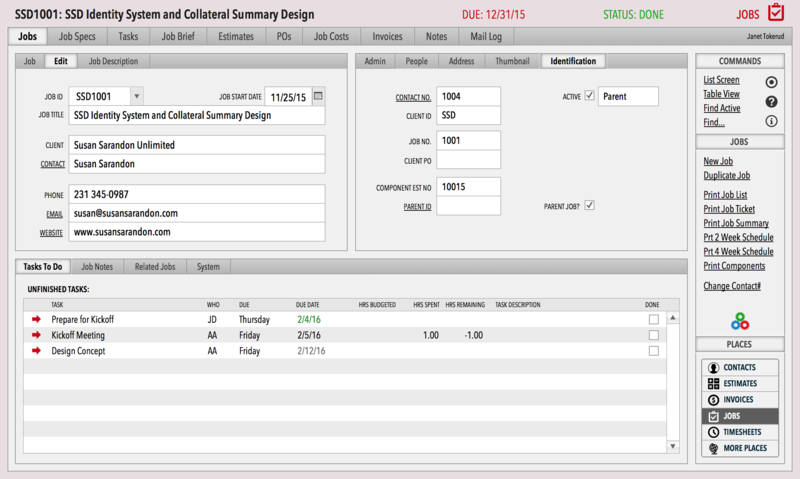 It shows you a quick read on job progress as well as a comparison of your estimate vs. actuals for your active jobs. 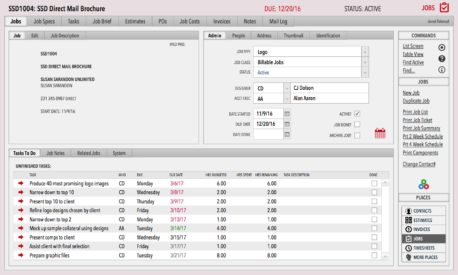 Optionally you can view any time frame, like the last quarter, for instance, or you might decide that a monthly report would be in order. No customizing required. [Click on the screenshot below to see enlarged.] Additionally, the report shows components. Many managers start their day by running the Job Summary Report so they can be on top of the status of current jobs first thing in the morning. 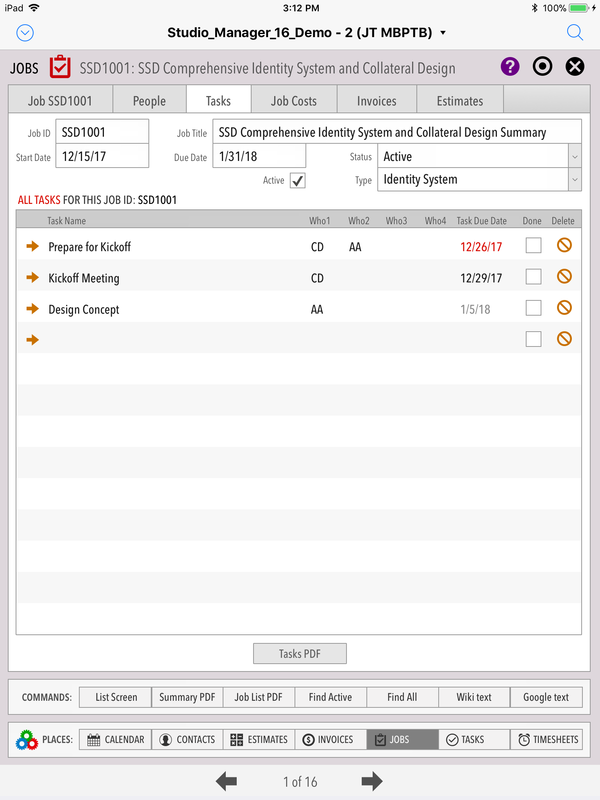 A common customization of Studio Manager is to set this report to preview in FileMaker, only optionally generating a PDF. Others like keeping the PDFs as snapshots: allowing them to spot trends and improve estimating accuracy. There’s now a Related Jobs tab that shows any components for the job you are viewing. In the sample below, we see the three components of job SSD1001 (which is identified as the “parent” job by the bullet that appears next to the Job Title). This portal acts as a navigator, allowing you zip around quickly between related jobs. You can print out a list of a parent job with its component pieces, showing estimates vs. actuals for each component and the parent job as a whole. 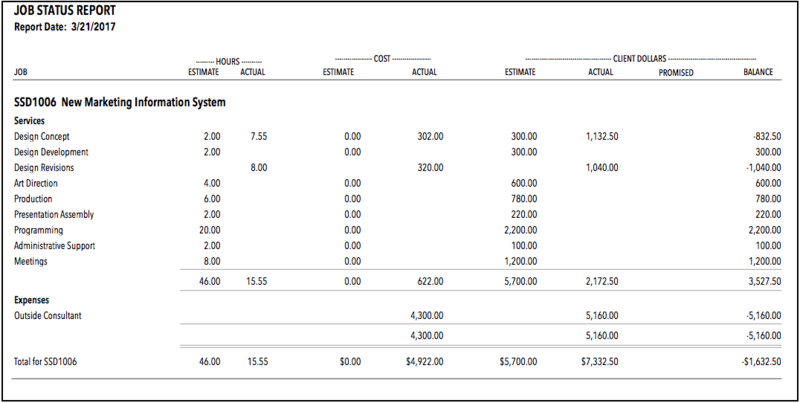 Remember, you or your production people (on a slow day) can easily modify this report to your liking with FileMaker’s easy and full-featured formatting and reporting tools. 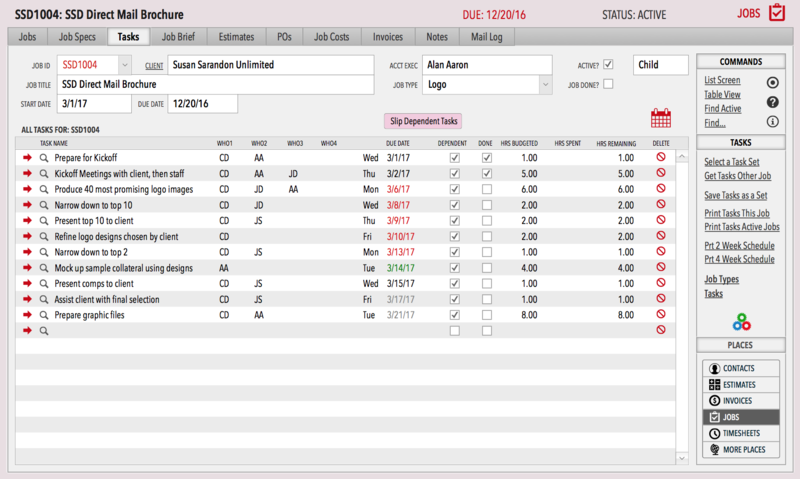 Detailed information about a single job can be obtained any time by running the Job Status Report. 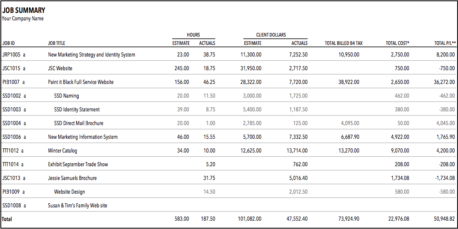 This report is especially helpful as you get close to completing it, because the data it provides helps you to decide where you need to allocate more time (or resources) and where to cut back. The Job Status Report is a manager’s dream. It makes the time used for data entry (into Estimates, Timesheets and Job Costs) totally worthwhile. Use it to ensure that every job is a profit-maker. The image below is a little small for this wide report [Click on the screen grab below to see an enlarged view.] 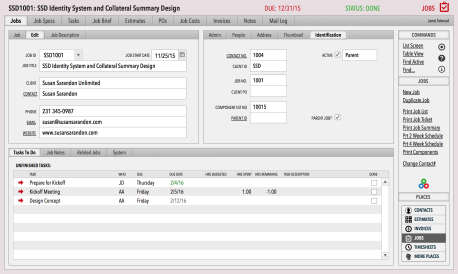 As is true throughout Studio Manager, you can customize this report or create a second report with a different focus by duplicating the layout and script. For instance, you might want to show only the hours columns for distribution at your next staff meeting… Let us know if you need any pointers.